Questa card è fatta solo di avanzi (esclusa la base, che è un cartoncino rosso piegato a metà). I bellissimi fiori sono un timbro di Cioccolato Barocco che avevo già colorato tempo addietro con i Promarkers (e lo sfondo con i Distress Inks). Li avevo stampati su un piccolo avanzo di cartoncino bianco e tagliati con la mia Big Shot manuale e una fustella stitched rettangolare. Anche le striscette rosse sono pezzi di una confezione di fustelle, mentre il piccolo pezzetto di nastro ha almeno 60 anni, l'ho recuperato nei bauli della nonna! Ho tagliato il cartoncino delle confezioni usando due fustelle scallop quadrate, ho incollato il nastro sul retro e l'ho legato sul davanti con un piccolo pezzetto di spago colorato di verde. Per dare luce ho incollato degli stickers metallizzati color oro: due lunghi sul pannello più piccolo e quattro farfalline sugli angoli. I'm always blown away with how you utilize things most of us throw away without a second thought! Everything you make is a work of art and you layered this beautifully with all the snippets! I just love those gorgeous flowers too! Beautiful creation! Una carta floreale così carina mi fa pensare ai giorni d'estate in queste fredde giornate invernali. Spero che tu abbia un buon fine settimana. Penso, e se magari ci devo rimettere la fustella...??? 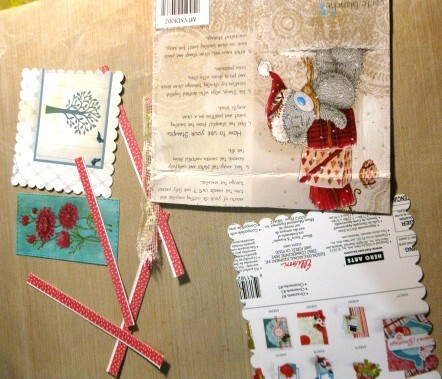 Gorgeous Alice, love the papers and gorgeous embellishments. Back donning my DT hat...Thank you so much for joining us at the Cuttlebugmania Challenge! I love your beautiful card, Alice. Happy New Year, my friend. 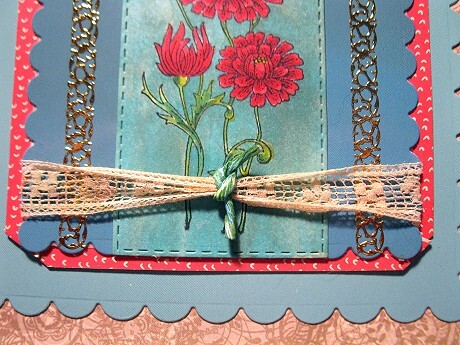 A beautiful card, such a pretty stamp and well done for using up your scraps. Bright and pretty and excellent extreme scrapping! 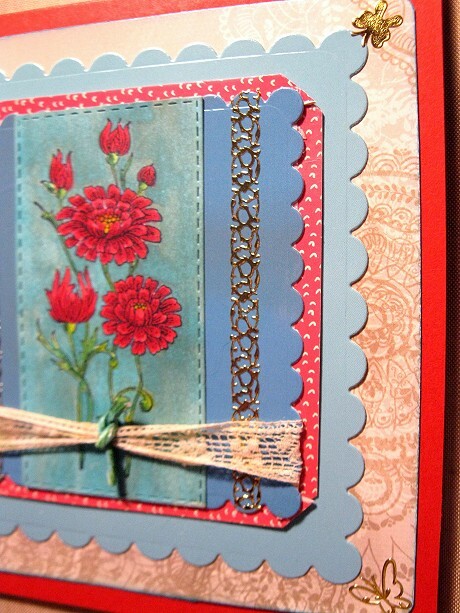 Fabulous use of snippets Alice and a really gorgeous card! Un riciclo fantastico... a dire il vero non sembra neanche un riciclo... bravissima! Tu sei la maga del recupero! La card è bellissima e quel nastrino prezioso per la sua origine! 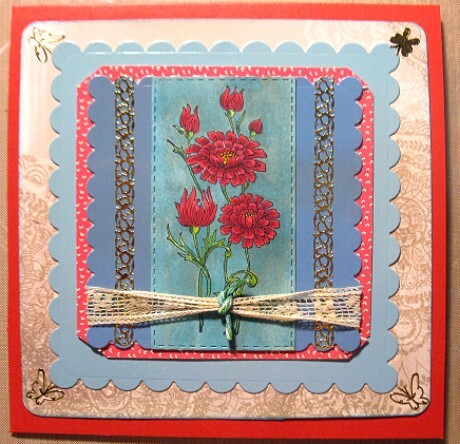 Such a lovely card with the pretty red flowers, layers and gold borders! Fabulous recycling! Beautiful card,Alice.Love the red flowers.Great recycling. Direi che è venuto fuori un ottimo lavoro!! What a beautiful card Alice! I love the colour palette, a great contrast and very appealing to the eye. The flowers are so pretty and the lace is divine! 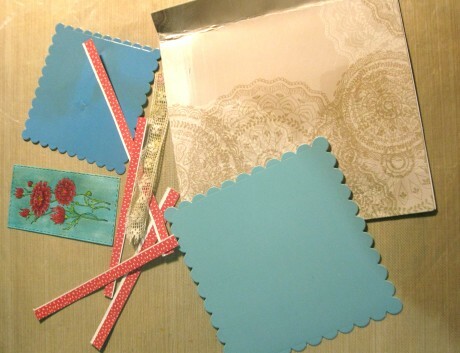 So many wonderful layers, the gold accents on the blue layer are very elegant, what a lovely touch! A stunning design my friend, what a fabulous way to use up some leftovers. Una card bellissima, Alice. Mi piacono molto i colori e i die cuts. Baci, amica. You're the queen of recycling! Take a look in my scrap boxes and you'd see I'm also a scrap collector, but you're far ahead of me! But these scraps from packaging make lovely details. The blue inked background makes the red flowers pop beautifully. Hello, my friend! This is beautiful! You always do an amazing job with recycling and repurposing! Just popping in to thank you for the warm welcome back to my blog! I am doing things differently now and won't be able to visit much but wanted to say hello! Enjoy your evening! However did I manage to miss this amazing card from all that scrap packaging. It is lovely and all goes together perfectly. Hugs Mrs A.
Grande riciclo, Alice, a volte basta anche solo quello che rimane sulla scrivania per fare delle bellissime cose. Viva "Cioccolato Barocco"! Brilliant work Alice, truly a snippetty card totally!! Love all the details you shared step by step. Beautifully ade creation, well done!